Brown the turkey in a large skillet with the onions and garlic. Meanwhile, combine the baking mix and water in a small bowl and roll the dough flat enough to cover a pie pan with rolling pin. (You may have extra dough). Add the Worcestershire sauce to the meat mixture. In a medium bowl, mix the cottage cheese and egg. Pour the turkey mixture into pie pan, then top with the cottage cheese mixture and the cheese. 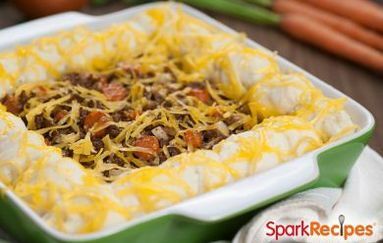 Top with the tomatoes and bake for 30-40 minutes.